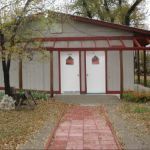 Ask fellow campers about "Santa Fe Trail RV Park" and nearby attractions. From other reviews it appears that GPS directions are suspect. Our Garmin RV660 fell into the same rut simply because the address listed is vague. Try 1022 Highway 468 Springer NM 87747. Without this address our GPS asked us to drive down a narrow dirt road for about 3 miles. Don't. Its easy to find. Just follow the signs to Springer. The park is just west of the Service Station on the main drag. Check in was very simple. We chose a site and I walked up to the office. I was about to slip our $18.00 into a slot provided when the owner opened the door. She took our CASH and supplied a receipt. A quick run down on what services were available in town and when they closed....done. Our site was course sand and grass. It was wide and long enough for our needs. Power (30), Sewer we available but the water had been turned off for the season. We were the only unit in the park. It was quiet and pleasant for an overnight stop. There are two restaurants in town both within walking distance. We paid $18.00 cash and feel we received good value. We would return if in the area. We camped at Santa Fe Trail RV Park in a Motorhome. Park is older, all pull thru, had some problem getting level in the MH but switched sites and was fine. Clear view of SW for satellite. Very friendly, cash only. Even though I25 is visible, quiet. Easy to find. We camped at Santa Fe Trail RV Park in a Motorhome. We stayed one night so we stayed hooked up. Our GPS devices had a little trouble finding the park before the trip so Bob manually entered the park's latitude/longitude. Once on the road the Rand McNally GPS device worked great. The Garmin GPS has been flaky ever since the last update. Google maps agreed with the Rand McNally so it broke the tie and it turned out to be right. We were in a pull thru and the full hookups looked convenient although all we used was electrical and we were in backwards trying our best to get a satellite signal. We had looked at satellite images prior to visiting. The office was closed when we got there so we started setting up. We were in a 30amp site for $18 which didn't bother us as the temperature was in the 60s so we wouldn't need air conditioning, much less two air conditioners. As Bob was digging around trying to find our 30amp extension cord the office lady came and said we could pull forward enough for our power cord to reach. That seemed to make a difference for our roof mounted dish, although at first glance we didn't think we would be getting much of a signal. Turns out we got great signal strength. We were also surprised how good our ATT signals were, 3 bars for cellular and 1-2 bars for 4g. The park does not offer wifi so we were very thankful for whatever signal we got. As we mentioned before the office lady was great. We planned to leave the next morning but the high winds prevalent this time of year have kicked up again. When we called the office about potentially a late checkout since the winds were supposed to die down by 3p she said stay as long as we need to, just be safe. Pay only if we stayed. The wind cleared up and we were able to leave. We would consider staying here again because how nice the lady was. We camped at Santa Fe Trail RV Park in a Fifth Wheel. 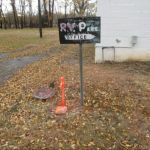 This small, quiet RV park has full hookup pull-throughs on mainly dirt sites, with no picnic tables or fire pits/grills. You pick the site you want. The nice lady that runs it will stop by your RV for a cash payment. The hookups are good (all but one are 30amp), and there is a small, older bathroom that is kept clean. No other amenities and over-the-air TV is dodgy. Verizon was 3-4 bars. This place is quite nice for a one-night stop over (which most of the people who camped there were there for only one night, including us). We camped at Santa Fe Trail RV Park in a Motorhome. Very few services in Springer... gas station and a couple of diners which close at 3pm. Small, local park in town. Very friendly and helpful owner lives onsite. Her home is also the office. I called ahead for info & she was very helpful. Dog friendly park (of course you have to clean up after your pets) but no dog run. Large trees on every site. Park is near the main roads and railroad track but very quiet. There's only one site w/50 amp (the rest are 30 amp) and we got it for our overnight stay. It's right next to the showers and bathrooms (which were all a little old but very clean). The price reflects additional $10 for 50 amp; the usual price is $18 for an overnight. No WiFi, no cable TV. The spaces are very very tight. We got in but it required a bit of finesse so it's not really big rig friendly. It would've been impossible to fit if we had been towing a car. We got our slides out but if there had been somebody next to us, we'd be touching. We camped at Santa Fe Trail RV Park in a Motorhome. A very nice, small-town RV park. Privately owned and manager on site. Lake close by. 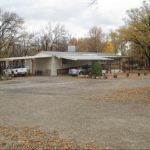 Quiet setting, well-maintained sites, and easy access into makes this park a great stop on Interstate 25 in northeastern New Mexico. We camped at Santa Fe Trail RV Park in a Travel Trailer. 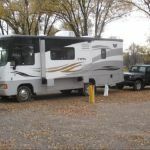 Are you affiliated with Santa Fe Trail RV Park ?